Further down you can preview all our currently available scores for the tune of Beethoven's 5 Secrets. Ludwig van Beethoven (also known as Bethofen, Bethoven, Beethofen), Ryan B Tedder is the composer of Beethoven's 5 Secrets. To view a specific sheet music arrangement of Beethoven's 5 Secrets please click the preview icon further down for the specific score that you are interested in. You can easily modify the instruments for which you are viewing all currently available sheet music scores. All you need to do is change the instrument selected (the default is "All Instruments") in the box next to the instruction: "select instrument". Have you purchased any of the arrangements of Beethoven's 5 Secrets, and would you like to leave a review for one of them? Then please click on the box marked Comments below and you may leave your customer feedback on any of the scores by Jason Derulo (also known as Jason Desrouleaux), The Piano Guys on this song page. You will need to select a nickname and be logged into your Great Scores account, but once that is done, you may leave your comment on the sheet music on this page. Would you like to share this composition on your Facebook wall or Twitter page? Then all you need to do is click on the share button, and choose the social media application that you would like to use to share this songpage. 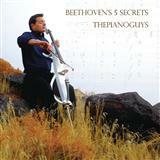 Beethoven's 5 Secrets is currently available in 1 arrangement. Furthermore we offer 1 instrument for which this composition has been arranged for.